What are dental students’ perception of the social and behavioural sciences? When we started out on this research project, we knew that some students are conflicted about studying social and behavioural sciences as applied to dentistry. For some, the challenge is that they simply aren’t interested whereas others are unconvinced about the relevance for dentists. Yet others find the struggle to be more fundamental: ‘Sometimes PPD lectures feel like they’re being delivered in a different language, I find it difficult to follow and understand exactly what points are being made.’ How many of you identify with these perspectives? The GDC requires all dental undergraduates to have a knowledge of the social and behavioural sciences as applied to dentistry. However, to ensure that they gain this knowledge, we need to (a) understand student perceptions and (b) determine how best to support students’ learning. Our research proposal was funded with a University Teaching Development Grant (2016-17). 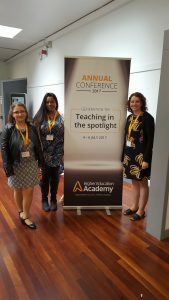 We shared our research idea with two (then) Yr 4 students – Katie Pilch and Dasna Jayawardena – and asked if they’d like to become co-researchers on this project for their elective. We worked as a team to conduct primary research and learn more about dental students’ perceptions of the social and behavioural sciences as applied to dentistry. 1. Most dental students consider the social and behavioural sciences to be either too abstract and theoretical or ‘common sense’. Either way, most felt that it wasn’t relevant to them as future dentists although one exception was the communication skills teaching. 2. Most students expressed difficulty with PPD assessments and some believed the exam to be unfair, inappropriate and difficult to pass. 3. Many students admit that a strong student ‘grapevine’ exists and, for the most part, word of mouth about PPD is negative. 1. We’ve changed the assessment from an end of unit exam to a piece of term-based coursework. We hope that this will reduce the exam burden and associated anxiety for students while maintaining an appropriate and rigorous assessment process. This proposal is in place for the academic year 2017-8. 2. PPD will continue to be patient-centred and become more student-facing and integrated with the clinical aspects of the undergraduate curriculum. We will ensure that these features are built into PPD delivery and assessment in the new curriculum. 3. We are experimenting with a ‘flipped classroom’ format where students are encouraged to become familiar with course content in their own time and to use contact time with tutors to clarify issues and misunderstanding through completion of formative assessment. In addition to improving our understanding of student perceptions, another benefit of this project was actively working with dental students as co-researchers throughout the entire process. In addition to working alongside each other on the project, we also co-wrote and presented our findings to The Higher Education Academy’s (HEA) Annual Conference held on 4th July 2017 in the University of Manchester. The presentation was entitled: ‘Dental students’ evaluations of the social and behavioural sciences in dental education- a student- as-co-researchers’ (see photos attached). We would recommend that more Faculty consider conducting primary research with students as co-researchers.